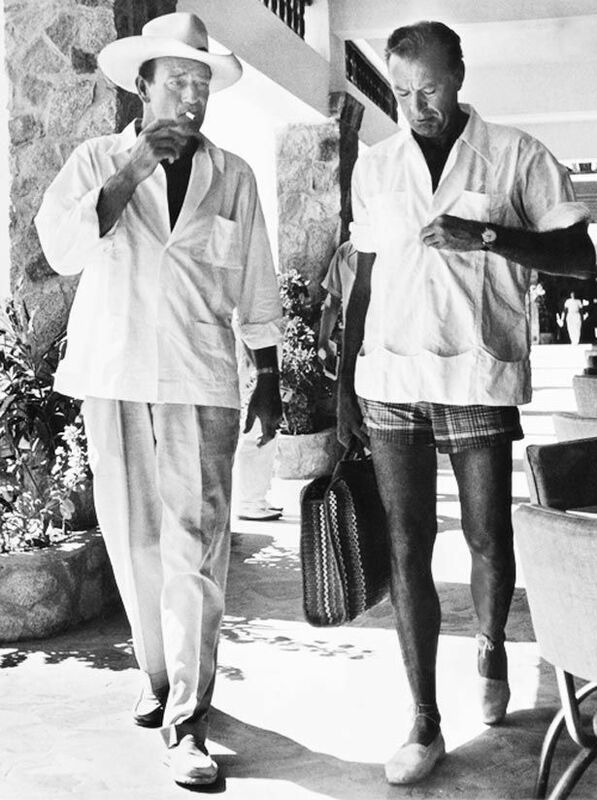 John Wayne is hardly a name that comes to mind when thinking of classic beachgoers, but photographs like this from Duke’s Acapulco resort in the 1940s taken by Phil Stern prove that Wayne (and fellow macho pal Gary Cooper) could be quite natty when the time came to relaxing under the sun. 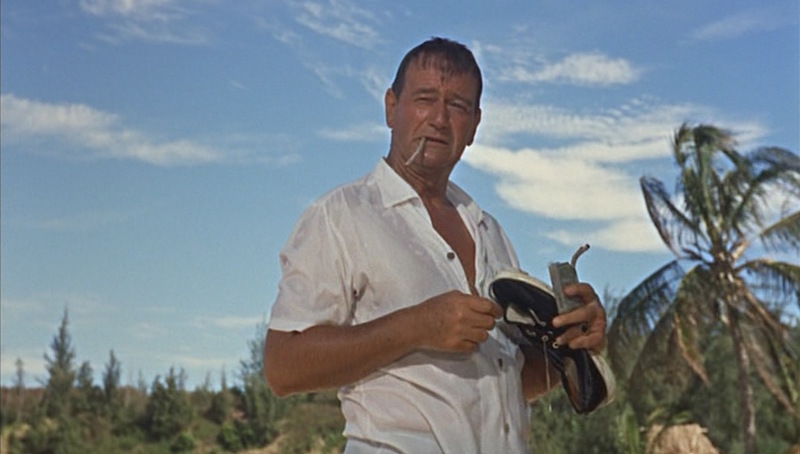 Guns Donovan (so nicknamed due to his wartime naval rating as a gunner’s mate), wears a number of military-inspired garments, but his attire for a day of ostensible leisure on the sea finds him in a more civilian friendly white short-sleeve camp shirt. The shirt has five metal buttons on the plain front, including a button under the right collar leaf that fastens to a short tab on the left to close the shirt over the neck. Guns wears it totally buttoned up on land but fastens only the middle two buttons when out to sea. John Wayne reminds me a lot of my grandfather in this screenshot, from the facial expression to the stance and even the way he is wearing his shirt. Guns’ camp shirt has a breast pocket for his unfiltered “Morley” cigarettes and a straight bottom hem like a bowling shirt or a traditional Aloha shirt that would also be worn untucked. The short sleeves would fall naturally to Wayne’s elbows, but he folds each sleeve up about an inch higher. The back is double pleated on each side, allowing the shirt to better fit on Wayne’s broad-shouldered frame. The sporty one-piece collar has no notch with a continuous line from the front of the collar leaf down the front of the shirt. Guns lets loose by unfastening the few top buttons of his shirt for a day out on the water. 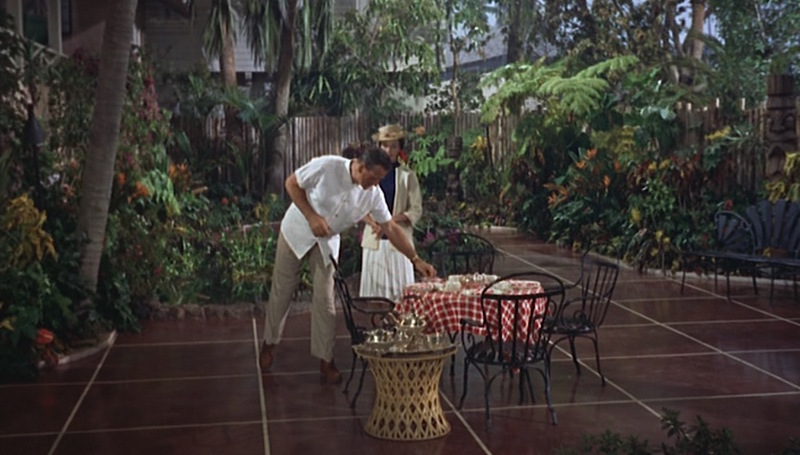 Before going out on the water, Guns wears a pair of khaki slacks that are likely the same lightweight cotton drill chinos he wears with his khaki military-styled shirts elsewhere in the film. The turn-ups (cuffs) on the bottom are another sign that they’re the same ones, so they likely have frogmouth front pockets and two patch pockets on the back and would be worn with a wide brown leather belt that coordinates with his brown leather chukka boots and beige socks that nicely continue the leg line from the trousers into his shoes. Guns Donovan’s camp shirt and khaki chinos is a fine afternoon outfit for a no-nonsense war veteran spending his days tending bar on a sleepy Pacific island. 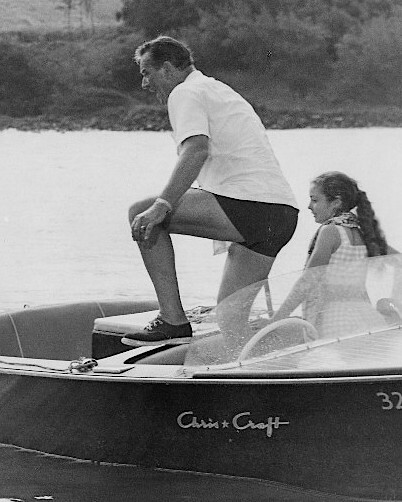 Once water-skiing becomes the order of the day, Guns wisely changes out of his slacks and into a pair of dark navy swimming trunks with a very short inseam. 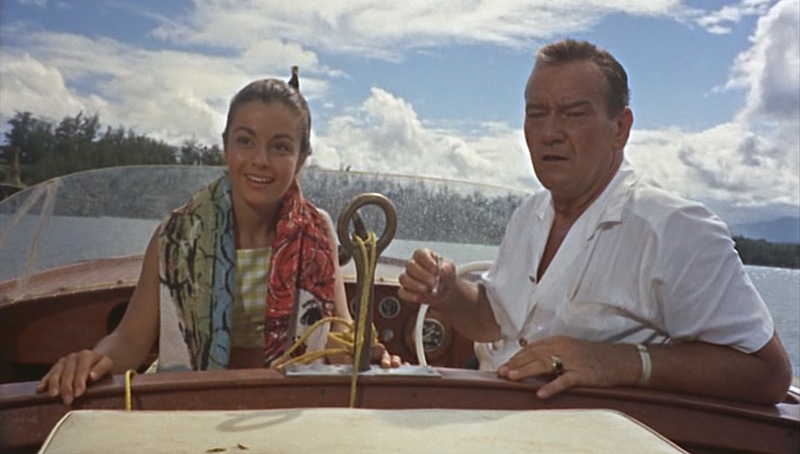 Elizabeth Allen and John Wayne in a promotional photo from Donovan’s Reef. He also wears a plain navy blue twill baseball cap, although he removes the “USN” anchor insignia pin that he wears through the center of the crown elsewhere. 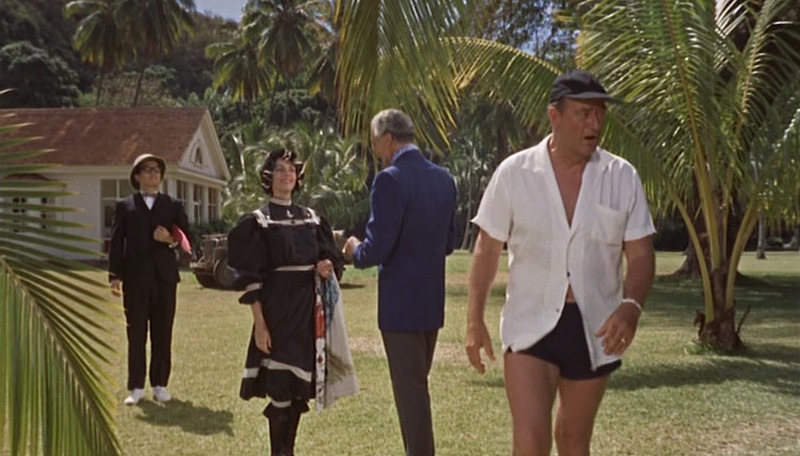 Cringeworthy sexism and racism abound in the dialogue of Donovan’s Reef, but Guns’ comment about Amelia’s “Miss Bunker Hill” bathing costume is actually pretty good. On the water, Guns wears the navy canvas sneakers that he also wears with his khaki shirt and peaked cap and later interestingly wears with his gray sport jacket and tie. The sneakers have dark navy canvas uppers, white rubber outsoles, and three white grommets for the shoes’ thin white laces. A classic staple of seaside workwear, canvas sneakers are still plentiful today with affordable options from Keds, Sperry, and Airwalk. Guns wears both of his gold jewelry items – a wristwatch and a ring – on his left hand. Like many military operators, Guns wears his watch with the round case on the inside of his wrist. It has a white leather strap that closes through a yellow gold buckle. Guns is decidedly less amused than Lelani by Amelia’s diving antics. 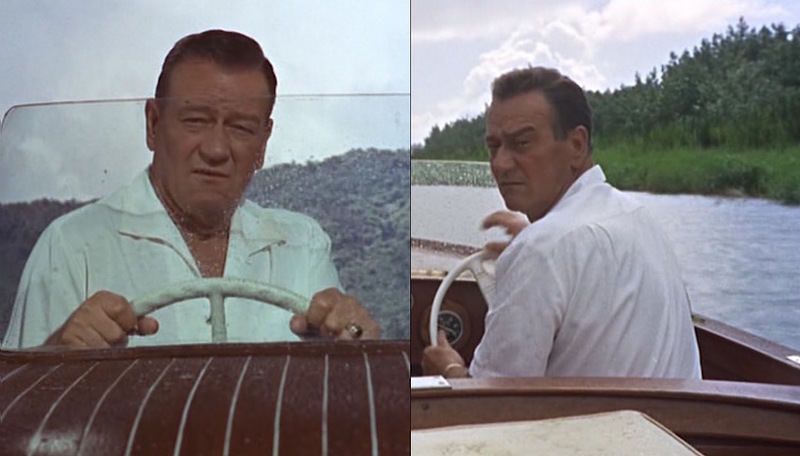 The origins of John Wayne’s ring has been the subject of some online discussion. It resembles a large gold class ring with a red garnet stone, and it is possibly Wayne’s personal class ring from USC, where he played football in the late 1920s but never actually graduated after a broken collarbone left him unable to fulfill the duties of his athletic scholarship. Despite the fact that it was a bodysurfing accident that had rendered him unable to play, Donovan’s Reef proves that Wayne certainly had no qualms about working so close to the water through the rest of his career. 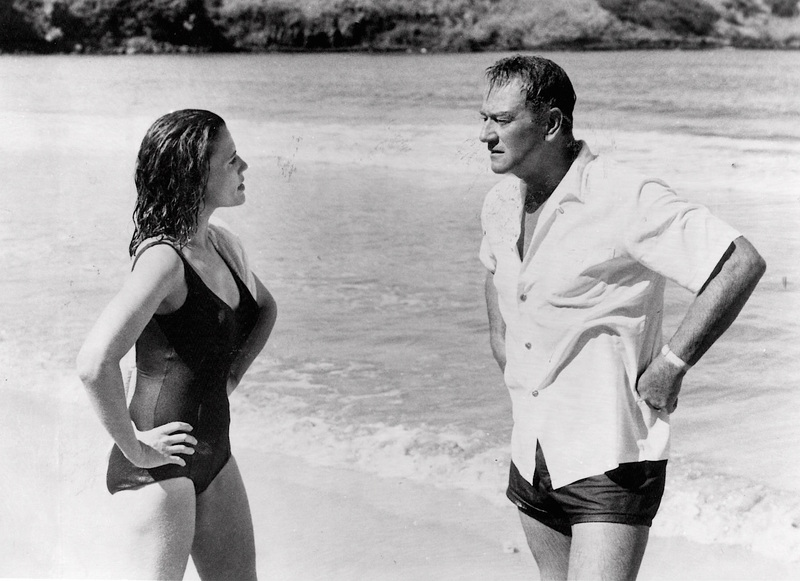 John Wayne and Jacqueline Malouf in Hawaii during the filming of Donovan’s Reef. 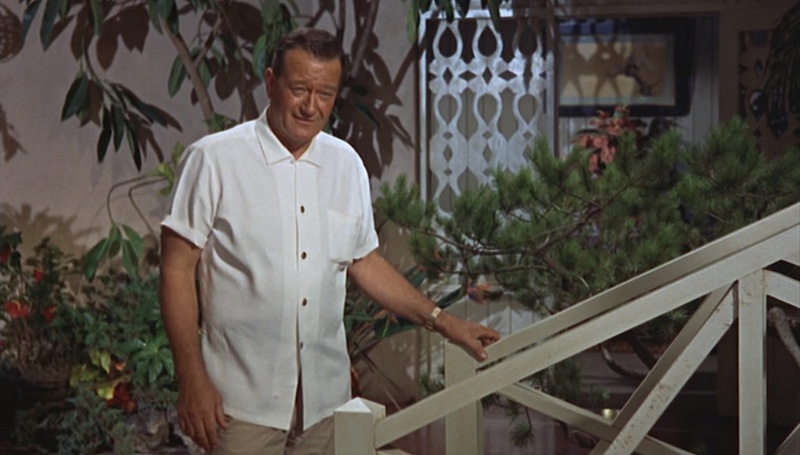 John Wayne provides a timeless template for comfortable seaside fashion in Donovan’s Reef. Jacqueline Malouf, the L.A.-born actress who played Dr. Dedham’s oldest daughter Lelani, would have celebrated her birthday today as she was born on July 3, 1941. Sadly, Ms. Malouf passed away in 1999. A great post. It’s refreshing that people are now accepting that Wayne, like other BAMFs of his era (Marvin, Mitchum, McQueen) was actually a remarkable actor and a great screen presence even if you don’t share his political views. I have heard he wouldn’t tolerate racism on his film sets or in his private life. His character in this film, for example, is accepting of inter-racial relationships which were not popular at that time. And HONDO and THE SEARCHERS were well on the liberal end of the spectrum, IMHO. It’s hard to imagine that level of respect “crossing the aisle” in this modern political climate; very characteristic that remarkable people like John Wayne and Katharine Hepburn would develop a mutual respect beyond political viewpoints.